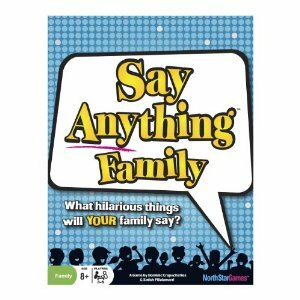 A little while back, the kind folks over at Northstar Games sponsored our very first contest by sending a copy of Say Anything Family to one of our lucky blog readers, and as a bonus they sent one to us too! We had high hopes for Say Anything Family because as some of you may remember we absolutely LOVED Wits and Wagers Family. Let me tell you up front that this game did not disappoint, it is one of the funnest family party games I’ve ever played. The game is easy to learn and explain. One person draws a card and selects a question from it to read out loud. Everyone else writes down an answer that they think the reader will think is the best answer. All of the answers are played face up, and the reader secretly selects the one they like best. The other players now try to guess which one the reader picked. Players score points for writing the winning answer, voting on the winning answer, and the reader gets points for people guessing right. It kind of reminds me of a cross between Apples to Apples (the playing and picking answers), Wits and Wagers Family (the betting aspect), and any one of a number of party games that rewards you for knowing the other players well or provides an opportunity to get to know each other better. While that may sound like a bit of a mash-up, it plays very smooth and really hit the sweet spot for us. This game is about the experience, but here’s a few quick thoughts about the rules/components/etc. I appreciate that this game is easy to teach, and that you really can just jump right in and play. No one seems to have any questions, it’s nice when the rules just blend into the background and the focus is on fun. I really like that each card has three possible questions and the reader gets to choose which one to pick. Aside from increasing replayability, this is an opportunity to direct the game a bit, avoid something you don’t want to talk about, or explore what the other players might think you think on a fun topic. This is the type of game you could really play for any length of time, but the scoring system seems to have the game play out for just the right amount of time. I did miss the meeples though! We love betting with the meeples in Wits & Wagers Family, and with the art of the game showing meeple images I found myself looking through the box a couple times to try to find them. There are tokens that are used instead, but I like the meeples better and wish they had been included in this game as well. Wits and Wagers Family was a big hit with my extended family over the holidays, so I was really excited to give Say Anything Family a try at a recent family get together. I was able to easily convince my mom and grandma, my aunt Judy, and my uncle Rob to give it a try. This game had us laughing, groaning, telling stories, and having fun together right from the get go. We were grossed out by the idea of kissing a urinal, imagining what the best part of being a dog is, pondering how lottery winnings would be spent, discussing who would be the most fun to have dinner with (Gene Simmons in full costume?!!? ), and laughing about what the weirdest family secret might be. We kept a causal pace throughout the game, with lots of conversation and smiles. It really was an amazing experience, and I’m looking forward to many more plays. It was a big hit, and we ended up with a phenomenal 12 thumbs up, everyone loved it! We’re going to try to play this game with Katie soon. Reading is the biggest barrier here, but I think it will be possible to help her through it, or to have her team up with a grown-up reading buddy. I’m sure her ideas will amuse and delight everyone playing, kids say the most interesting things! I am a gamer. I have played games most of my life, and all of my adult life. Most of my gaming time is spent on board games, but I also play roleplaying games, card games, and the occasional video game. It's an excellent hobby and has made me many friends, including my wife. It has and continues to enrich my life in many ways; one of those ways is by sharing the hobby with my children. I'll tell you why. It's a proven fact that kids who play games are smarter; see the research. I definitely want my kids to have every developmental advantage and I fully believe that the type of reasoning that is necessary to play games will lead to creative and analytical ways of interacting with the world. Being able to weigh choices in the controlled environment of a game will help acquire the skills they need to succeed: resource management, weighing long term vs. short term investment, anticipating the actions of others. Exposure to these concepts early on will help them develop a more integrated and multi-faceted view of the world, be better problem solvers and and better at thinking ahead. In an age where communication is increasingly less face-to-face, it is more and more necessary for kids to learn social skills; board games are a great teaching tool. Not only are you sitting around a table with fellow players, you are in conflict with them in a standard game, or on a team with them in a cooperative game. It creates a slightly more complex and nuanced interaction with the people participating. This is a great teaching opportunity for concepts such as teamwork, civility, and the idea of being a good winner or loser. These are social skills that my children need, and will serve them well in their lives. Families need to do things together to be healthy; it's the basic premise of the much-used "Families who X together stay together" (replacing X with whatever activity supports your opinion). There's a reason people say that: families who bond by pursuing a pastime together tend to have more cohesion, and more common ground. 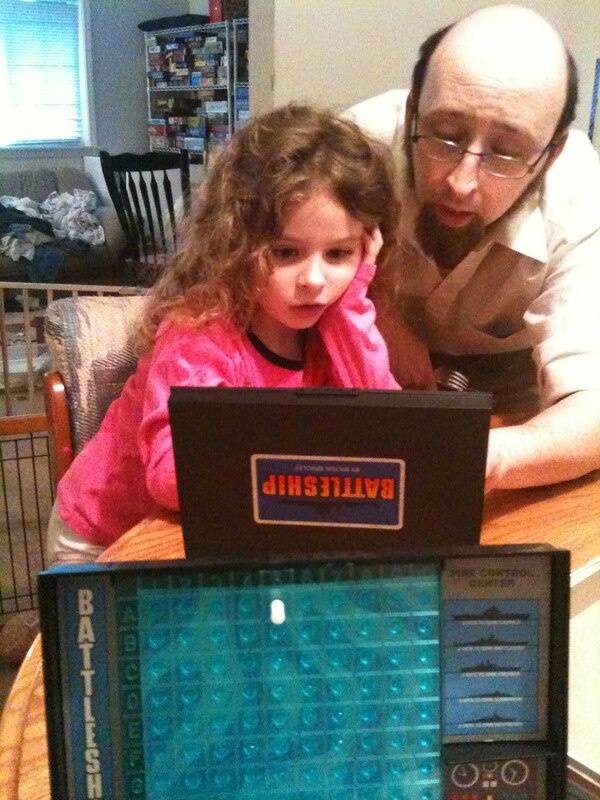 Games are a great way to interact with children. For those of you familiar with the banking model of positive behavior support, games a great way to make "deposits" in the bank of trust for the parents ("withdrawals" happen when applying discipline). It's not hard to find articles on the benefits of playing games with your kids, if you look. And it beats the heck out of watching TV! Young minds need to explore and discover; their minds are little superprocessors cataloguing and interpreting what they interact with and their experiences. A game offers a lot of tactile experiences. Want to see some exploration? Open a game box and put it in front of a toddler and let her sift through (making sure to be aware of potential choking hazards). There are all sorts of amazing, brightly colored, and odd-shaped bits... possibly a board... and other things. Watching a little person look over each of the things, play with them, and make up ways to have them interact with each other is fascinating. Exploration is great. As an older kid, actually playing the game (as opposed to with it), and other means of exploration present themselves. Games offer contained little worlds to try different thing... a controlled environment where it is okay to fail without consequences. Being able to explore opportunities and not worry about the consequences of failure is one of the greatest parts of playing games, and cannot be understated. Kids are creative creatures, and love making art and participating in imaginative play. Games have creative and varied themes, and gaming with you kids may just add a little fuel to the fires of their imagination. For instance, after playing a game about horse racing, my daughter was inspired to draw a picture of a horse, and when I told her I was designing a game, she jumped in with a load of suggestions of her own. Additionally, I have seen my kids engage in imaginative play where they use words and concepts picked up from games. I personally believe that creativity is something to be nurtured and helped to blossom, and games are a great starting point for other forms of creativity. The acquisition of vocabulary in children is a big determiner of academic performance later in life. Games are excellent in that they often teach vocabulary indirectly in a fun way, and in a context where you learn related concepts. A game about exploration may teach words about exploring, expeditions, and idols, and a game about trains may talk about goods, passengers, and connections. And they learn about it in an active way, where they are relating it to actions that they take in the game. The research I've seen talks about quantity and quality of words a child hears in their early years, and playing games and discussing the concepts in games can certainly give them a boost. Gaming can be a very cheap hobby, depending on how you go about it. A typical game costs about the price of taking the family to the movies, maybe even getting refreshments as well. A movie is over in a couple hours, but a game can be played over and over again. I cannot tell you how many times I've played my copies of Settlers of Catan or Attika; I can tell you that I have had so many hours of fun playing those games with family and friends that it's hard not to smile when thinking of playing them. It's true that you can go overboard and spend loads on games, but you do not have to. A handful of good games, purchased after reading reviews and possibly trying at the game store or with friends, is all you need. And if you really want to game on the cheap, keeping an eye on thrift store game shelves can turn up some gems at a small fraction of the price. I encourage supporting your lolcal game store, though, but other options exist. Ever heard someone say, "Kids say the darnedest things"? Well, they do. They interpret the world through fewer filters than we adults and often come up with brilliant insights. Pay attention! Write stuff down, if you need to. I often find myself thinking about what one of my kids has said to me. And the better the input, the better the output. Show them a game about elves and dragons, they'll name them and talk about their mommies. Show them a game about aliens conquering worlds, they talk about making friends with them. Seriously... listen to them; you'll be surprised at what you hear. Games, even non-abstract ones, usually have you manipulate things that represent other things. Little black cylinders can represent oil drums, cubes can be influence, and some things may not actually represent anything, like the stones in a Mancala game (before that one comes back to bite me, I'll just say that if they represent something, I don't know!). The concept that something can represent something else is a big cognitive leap, and games help introduce and reinforce this concept. Gaming is a great hobby. It's an excellent pastime to share with your kids, and may even play a significant role in their life; it has in mine. Some of my best friends I have met through gaming, including my wife. Sharing something like that will mean that no matter what, you'll have something fun to share. And they'll likely pass it on to their kids. It's a great gift to give. And further, you may just end up with a new best gaming buddy, or that one extra person that you need to play your newest game! Convinced? Check out what my wife Angie has to say about getting started gaming with your little ones for some practical advice about introducing kids to our favorite hobby. And leave us a comment, we love to hear from you! Hello! We have another review for you today. The wonderful people at Funleague Games provided a review copy of Perfect Stride, a game about horse riding. It's a very thematic game that Angie, Katie and I tried out; here's what we thought. This is a game about horses. I wasn't sure I could get into a game about horses, but I was happily surprised. Players assume the roles of riders who are racing to complete the most jumps and stay in the lead. The theme might not appeal to some, but this game does a great job of bringing the theme to the forefront in look and feel. The first thing that you'll notice about this game is the art; it's a beautiful game. Every card has unique art, with no duplications (save for a few cards with multiple copies). The full-color paintings really bring the theme to life. A rough count tells me that there are around a hundred unique illustrations on cards alone, not counting the box and rulebook art; there aren't many games that can boast this much art of this quality. Additionally, we found oursleves taking the time to stop and read the flavortext on each card; Katie in particular enjoyed that. Katie was even inspired to draw her own idea for a card for the game, and she rarely does that. There are two versions of play for Perfect Stride: the basic game and the full game. Angie and I played the full game first to get a feel for the rules, and then started off with the basic game with Katie. After playing through the basic game, we talked with her about the other cool cards in the game and she decided she wanted to try those out, so from that point we were playing something in between the two. Both versions have riders competing to go through a course of jumps. Every horse will have a kind of jump they're good at, and each jump has a Difficulty. You need to have enough Effort to meet the Difficulty, and you get this from skill cards. Each horse that makes the jump gets a ribbon (this game's victory points), and moves to the next jump. Pretty straightforward and simple. The advanced version is far more interesting and strategic. More of a racing element is present, and being in the lead will earn you more points. There are also events that happen at every jump, which can change the difficulty for better or worse. There are also power-ups for horses called Horse care cards. What I found to be very interesting is that the advanced game has a bid mechanic for determining who's in the lead. Everyone starts with four cards representing speeds (Walk, Trot, Canter, Gallop) and a draw value for cards that decreases the faster you go. I found that this in particular was a great element for bringing the racing element to life. Just one more note about the game play: the minimum age on the box. I really feel that the designers have assigned too high of a minimum age by saying it is for thirteen years and older, and think they should consider altering that on later printings. I don't think any of the concepts present are that difficult. I think that about ten years old would be a good minimum age for the advanced game, and eight for the basic. The basic game does require reading and basic math, and that is why I wouldn't recommend that too much younger. Our five year old daughter Katie loved it, but needed help with the reading (and just a little with the math). I'm worried that some parents who would otherwise pick it up for their children may skip it due to that, which is unfortunate, since it is a wonderful game. Katie's idea for a Horse Care card! It was awesome! I like horses. The cards are great. They can get you past jumps. Sometimes they are jumps and can get you ribbons. I think the person that did the art made great pictures and details. I want to play again with the horse care cards and event cards. Speaking of playing again, let's play right now! There you have it! We liked this game quite a bit, especially Katie. There's a fair amount of randomness in the skill cards, moreso than in most games we play, but that is actually good for a family game in that it levels the playing field a bit. Honestly, we were surprised at how much we like the game. Though I don't imagine it will be one that Angie and I necessarily clamor to grab off the shelf, we were quite happy to see Katie so engaged in the theme; I get the impression it will be a game that she will want to play again soon. And here I thought we were going to skip the "Daddy, can I have a pony? Please?" stage! Worlds Collide: How I'm Turning My Love of Games into a Career! Looking forward into the future of education, I am excited about the possibilities. I imagine a classroom in which students are engaged, motivated, and academically successful regardless of background. I believe that this is an achievable vision, and I think that what students need to accomplish this is to play more games. Research studies are consistently showing the intellectual and social benefits of gaming, and demonstrating how games can help us learn to become motivated problem-solvers and creative thinkers. Games research has shown that games can help close the achievement gap, promote engagement in academic material, motivate students to stay in school, and enhance social and intellectual skill development. During my Masters of Education program, I took a class entitled Action Research. Throughout this course, we were challenged to think about problem solving through research and taught how a methodological approach to answering important questions in education practice could result in improved classroom results. As I learned about this approach, I began to consider what question I would most want to answer. My conclusion was that my question was bigger than a single classroom. What I want to know is how can a teacher, who is excited about the possibilities a games-based learning approach can offer, implement games into the classroom in a way that will help enhance learning and increase student outcomes? In other words, how can we implement games-based learning as a core curriculum component? How can I work towards contributing to this vision of the future? It’s not like a “good idea” is enough; I need evidence based best practices to back up my ideas, and a solid understanding of both curriculum theory and leadership techniques for implementing positive institutional change. I decided to pursue a doctoral degree in Educational Leadership and Curriculum/Instruction, with hopes of diving into and becoming a part of the research I am so excited about. I intend to devote my energy and attention to researching, developing, implementing, and sharing solutions to this challenge. The teacher in me is elated about the educational possibilities and the gamer in me is stoked for another excuse to play more games. Win-win! I'm planning to occassionally post about my progress, interesting artciles I come across, and new ideas relating to using games in education, so I wanted to start of explaining where I'm coming from and what I'm hoping to accomplish. As always, feel free to leave comments, ask questions, or chime in with your thoughts! That's How I Role: My Zen Archer Monk! Introducing That's How I Role, a new category of posts. 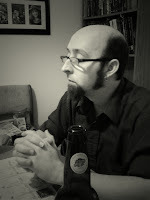 Whenever we post our own content about a classic pen-and-paper roleplaying game that we're playing in, excluding reviews or general discussion, we'll add that label. Hello! Any roleplayers out there? I hope so. Roleplaying games (RPGs) haven't received a lot of wordcount on our blog so far, and, since it's my favorite type of gaming, I think it's time to correct that. Today, I'm going to discuss a character I play in a new Pathfinder campaign. For those unfamiliar, the Pathfinder RPG is an overhaul of the Dungeons & Dragons version 3.5 rules. If you want to check the rules out, they're available for free here; it's an open source system. A spiffy thing about this new campaign is that it was spawned by a discussion on this blog... and I think that's pretty awesome. I often get excited when new character making options present themselves. A while back, I picked up the Pathfinder Advanced Player's Guide, a supplement that added options for players, including new classes and further options for existing ones. Some of these caught my eye; specifically, the new Inquisitor class and the Zen Archer archetype for the Monk class. The Zen Archer archetype made me want to play a Monk; I can't really say I had ever wanted to before. Seriously. The core class, though made very interesting in its Pathfinder version, was a very specific type of character. It's a great set of abilities, but the Asian-themed flavor seems out of place in what is typically a quasi-medieval fantasy. The Zen Archer swaps out a lot of the Wuxia-style abilities for archery abilities. I'm not going to detail all the abilities ad nauseum, but the classic Flurry of Blows for this variant is only for attacks with the bow, and at third level they may use the Wisdom modifier instead of Dexterity for bow attacks. Very interesting! A good base for my character. A new full twenty-level class from the same book, the Inquisitor, also offers some great options. The theme of the class is a divine huntsperson who seeks out enemies of the faith. It offers medium combat abilities, a secondary spell progression and a set of abilities called Judgements. A judgement can be pronounced in a battle upon one's enemies, and gives a bonus of some sort (bonus to attack, bonus to damage, increased ability penetrate spell resistance, healing, some others). Additionally, they also get a geat sprinkling of other fun abilities. An excellent class on its own, but I'm using this as a secondary class to "dip into" to snag some interesting abilities that complement my character idea. For a race, the answer was simple: an elf. Elves are archers, right? Looking at it, it seemed pretty simple. A closer look at the Zen Archer Monk, though, makes it clear that WIsdom is a very important ability score, and elves do not grant a boost to that. Oddly enoughh, a dwarf would be better. Humans are always tempting, as well as both the half-elf and half-orc, since any of those three would allow a boost to Wisdom as well. My concept fits an elf better, though. So that's what I chose. When I think of the portrayal of Legolas in the Lord of the Rings movies, I kind of see this character being that kind of archer (well, later!). So elf it is! The campaign, set in the default Pathfinder world of Golarion, this character is in had a quirky twist to start it off: all the player characters had been turned to stone prior to the start. So I felt a little creative license with that to create a character who had lasted walked the earth over a thousand years before. The scion of a noble house, his family believed him to be the reincarnation of the warrior who founded the house. As such, he was trained to be a warrior and was quickly given command of troops when a Gnoll uprising happened. His lack of experience resulted in being ambushed and losing his whole command and left for dead, he was found and healed by a wandering priest of Sarenrae. Ashamed, he decided not to return to his homeland. All he has to remind him of his past life is his bow Malachiel, said to be created by the founder of his house (and named after him), and his sword. He lived among (mostly) humans for the next several decades, living the life of a traveling scholar... until he encountered a medusa some 1400 years ago. That is the story of Hallyr Narcissar... Currently, he has thrown in his lot with some others who had met similar fates and were awakened with him. At the time I am writing this, Hallyr has just gotten to level three. He has two levels of Monk and one of Inquisitor. A first level version of him can be found here. I'll skip a stat block unless explicitly asked, but that's the current character I'm playing. That's how I role! :) Anyone else playing something they're excited about? Or want to? Who knows, another discussion here on GUG could spark up a gaming group for someone else... and we love to see your comments, anyway! Hi, everyone! I was thinking that today I should diverge a little from recent content, which has been more heavily focused on reviews, and tell you a little about myself. Specifically, I want to tell you why I game. If you've followed the blog at all, you'll have a general idea of what my family likes to play, so I'm going to throw out another angle. Here's what motivates me to sit down at the table and get my game on. That's an easy one, right? Of course I do it because it's fun. It almost goes without saying. People play games... because they are fun. I am no different in that regard, though my uses and gratifications may not be exactly the same as another person. In board games, I like to execute interesting strategies. In roleplaying games, I like make interesting characters and see their stories unfold when put in interesting situations. These things are fun to me. It's also fun to see other people do these things, too. Winning is fun, too, but honestly, I'd rather lose by a small margin than win by a huge one. Why? Because that usually is not fun, even for good sports. And I have the most fun when others are having fun, too. Some games, particularly strategy board games, are a kind of mental calisthenics. Just think about it: you are introduced to a closed system that has its own unique rules. You have some finite amount of resources (which could be time or moves), most likely roughly equal to your opponents. With these, you are tasked to employ a strategy better than your opponents, possibly having to employ tactics against them whilst they work against you. This requires and develops reasoning skills, forethought and the ability to predict what opponents will choose. Have you heard the quip "The brain is a muscle; if you don't use it, you lose it"? That kind of sums up my feelings about that. Unless you play solitaire games exclusively, gaming is a social activity. Whether just playing something with my wife, or my kids or friends, I appreciate having a fun activity in which to participate. I am a social creature and games allow you to interact with anothers on a different level. My wife and I often have great conversations over a game. When meeting new people, I find a game can be a good icebreaker. Many of my friends I actually met because we gamed together... my wife included! Games are a great family activity. It beats zoning out in front of the television! I really like playing games with every member of my family. Even the two year old, Jack! I just love seeing the wheels turn when the kids figure out something neat in games, and appreciate very much what that means for their cognitive and social development. I love gaming with my wife, too. It's an excellent way for us to engage in a mentally stimulating activity together after the kids go to bed. So that's a little bit about me. That doesn't necessarily sum up every reason I play games, but it hits the main ones. Without a doubt, I'll come up with another within a few minutes of posting this. I hope you enjoyed a little insight into me as a gamer! Have a great day, and be sure to share why YOU play games! My goal for the year is to play 100 different games and I played half of a half of my goal in a half of a half of a year... Which is a quarter on both of them. So I'm a quarter of the way done! That feels good to me because that means I've played at least a whole bunch of games from trying to get my goal. Goals are good because sometimes you get them and then you feel really really proud of yourself. I wrote down all the games and so the circled numbers are how much I rate the game. My ratings is how much I like the games, it's just kinda random depending on my mood. Like sometimes I feel like its small or great or weird, you know, so then I give it a number to explain how I feel. It's makes sense to me. 2. Wits and Wagers Family: I think that its cool because my whole family played it and it has family in the name which is like us, my family. 3. Connect 4: Connect 4 is a cool game because you try to match 4 in a row and that’s the name. I play this with my friends. 4. Pictureka Matchureka: I think this is neat because it has 5 games with the same cards, and all the games use them. 5. Quack Quack: This is kinda complicated because you have to find the right colors. I like complicated games. 6. Formula De: What I don’t like about this game is it isn’t complicated enough. I like it anyway but ya know, not at least so much. 7. Uno: I played Uno with my grandma and grandpa and I liked it and I like them. 8. Frank’s Zoo: I just don’t have anything to say about this game. I don’t remember what I was going to say about it when this came up. I’m easy about forgetting things. 9. Guess Who Extra: I play this a lot with my friends. I like the funny faces and the aliens and monster boards best, also the robots. 10. Polterdice: That one, well… it was… fun I guess,,, but it started getting sort of too easy and kind of boring and apparently we stopped playing it. 11. Enchanted Forest: I like this because you try to find the right things under the trees. I have to remember things, like if there’s a star and I don’t need it but the next card might be the star so I have to remember where they are. 12. Forbidden Island: I really like this one. I keep playing it because its complicated and that makes it interesting. I like working together and helping people, you gotta help each other out of the island because it’s sinking. 13. Stone Age: I played this with my dad and another time with my whole family. It is a little long, I like long games too but sometimes I really have to quit before its finished. 14. Squint: Squint isn’t complicated, only I like other things about it. One of them is I like making pictures, and I don’t remember the rest but I know there’s other things I liked. 15. Froggie Boogie: I like to play this and so does my brother, he likes the frogs. I think my dad likes to play this sort of but my mom yes because she loves games. 16. Crazy 8’s: Nothing to say about this. 17. Zingo: I like Zingo because I just think its cool! 18. Amazing Labyrinth: You try to get through the labyrinth and grab the last card out of the pile and get that before anybody else gets their last card. Funny and crazy. 19. Go Fish: It is mediocre. I don’t know what that means, I just said it. It’s a good thing I think. 20. Castaways of Deadman’s Bay: This is a good game because there is a Jack like my little brother and Kate which my name is Katie but my real name is Kathryn but my parents sometimes call me Kate so that’s really cool. 21. Memoir ‘44: Super! I’m secretly known as Flash, and also on my team is Super Tulip (which is a new super hero) and Batman and Ironman. We all fight to save people. Memoir 44 is cool because it has fighting in it and you have little army guys and you have to knock the whole other team out to get medals. I’m smart, and you have to be smart to play this game. 22. Battleship: I think it’s cool and there’s nothing else to say. 23. Tsuro: This game is kind of miniature. I want that to mean crazy and a little frustrating in a good way. 24. Trans-America: That was trainy. There’s a map of the states. 25. Rock-Paper-Scissors: I can’t think fast enough and decide so I have to turn around of close my eyes when we’re counting. It takes me a while to choose what I want to do. I like to play it with my mom, sometimes my dad, but not Jack because he doesn’t know how! Whew! It was like the longest conversation in the world to talk about that many games. My mom wrote down everything I said and it was kind of like writing the biggest blog post ever. I hope you enjoyed reading it and I hope you like games because that’s what our blog is all about. I love love love love games. Every kind of game that’s complicated, sign me up! I was going to give my mom a high five for finishing this but my hands were full so I thought about using my nose, against her hand... but then I figured that would hurt so now I'm cracking up! Hahahahaha! Silly me. Bye-bye everybody!